Cheltenham Racecourse: If your pick up/set down point is the Cheltenham Racecourse they now lock the main gates in the evening (7.45pm). The driver will contact security to advise of an ETA and they will then open the gate to allow exit, but please note that security may be on patrol and have to make their way to the gates so could take a few extra minutes. Due to the coach having to use the Park & Ride bay, the driver will not be able to wait for latecomers as they have limited time allowance. Please note the Hippodrome Casino is an over 18s venue and valid ID will need to be presented by all members of your party on arrival in order to gain access to the event. Important Information: Guests will be subject to a person and bag search. Please only bring essential items and keep belongings to a minimum. Please note there are no temporary storage facilities for non-permitted bags, so it will be left to the guest to find a safe temporary storage facility. Visitors who may require disabled access must inform US at the time of requesting a Booking to ensure the best experience for all. Due to the nature of the attraction WE would strongly advise you that the attraction requires a degree of walking and standing including walking over cobbled streets. Any children under 16 years of age must be accompanied by a person aged 18 years or over whilst on a Tour or on OUR premises. Children shall remain under the control and supervision of a person aged 16 or over at all times. No children under 5, prams, pushchairs or babes in arms admitted. Please note that the leave time for the Harbour Festival is early evening. Please note that this is a long day trip, it can take up to 3 hours to travel through the lights, this does mean that it can be the early hours of the morning when you return to your drop off point. Please note that the collection times may change slightly depending on the time slots available for the coach drop off in Bath. Children aged 12 and under must be accompanied by an adult. The use of flash photography, tripods or other specialist photography and audio visual equipment is strictly forbidden. Purchasing a Ticket to the Exhibition confirms a Ticket Holder's consent to the filming and sound recording of themselves as attendees. The museum may use any such films or recordings (including any copies) without payment to the Ticket Holder. Any such filming and/or sound recording will be carried out in accordance with the musuems Safeguarding Policy, details of which can be obtained from the Venue or at <http://www.liverpoolmuseums.org.uk/about/corporate/policies/safeguarding-policy-NML.pdf>. Ticket Holders may only leave and re-enter the Exhibition at the museums discretion. Otherwise, no re-admission will be permitted. No food and drink is permitted within the Exhibition. In order to maintain the correct environmental and comfort conditions in the Exhibition, you may be required to leave some of your belongings in the Venue's manned cloakroom before entering the Exhibition. This includes, but is not limited to, any wet items, such as overcoats and umbrellas, and any large items or large items of luggage. Ticket Holders must comply with all safety announcements and Venue regulations whilst attending the Exhibition. For safety and security reasons, a one-way system operates along the visitor route. On arrival, you and your belongings will be subject to airport-style security checks. Please try to bring as little as possible with you as it will help you to get through security screening more quickly. Some items, such as large items of baggage, backpacks, pushchairs, pen-knives and scissors will have to be checked in and reclaimed at the end of the visit. Photography, video recording and filming including the use of wearable devices for non-commerical purposes are not permitted inside the State Rooms. Photography and filming for non-commercial purposes are welcomed in the garden at Buckingham Palace. In consideration of other visitors, mobile phones must be switched off inside the State Rooms. Eating and drinking are not permitted inside the State Rooms. You will be asked to place drinks and food in closed bags before being admitted to the Palace. For safety reasons, pushchairs cannot be taken into the State Rooms. They must be checked in and reclaimed at the exit. Baby carriers and hip seats can be borrowed free of charge, subject to availability. As a World Heritage Site, Avebury has a unique and ancient landscape. 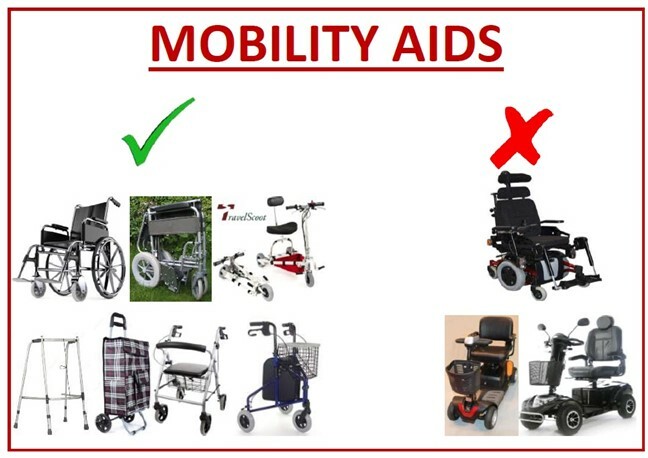 However, this means that there are physical limitations on what we are able to offer for visitors with mobility restrictions. Please consider the needs of any elderly or physically impaired members of the group, as some may find the walk from the main car park taxing. The distance from the main visitor car park to Avebury Manor is about 500 metres and the paths can be uneven, including cobbles and gravel. Insurance is compulsory for our holidays to Europe and the Channel Islands. You must provide confirmation that you have arranged adequate insurance cover. We advise passengers to take out on insurance on holidays in the UK also in case they need to cancel for emergency reasons. We will make every effort to comply with requests for special diets, low floor accommodation, etc and these should be notified to us in writing at the time of booking and detailed on the booking form. We cannot however accept any booking that is conditional upon guaranteeing special requests. Some of our featured hotels may offer sea view rooms. These can be requested, however not guaranteed. Only one bag per passenger, 20kg hold luggage allowance plus one hand baggage. Condor Ferries have informed us that from the 1st March 2019, any passengers travelling with them on a domestic sailing (interisland and between the UK, Guernsey and Jersey) will be required to take photo ID. Please note that all photo ID must be legible and undamaged, otherwise you will not be able to travel. PLEASE NOTE THAT PICK UP TIMES MAY BE SUBJECT TO CHANGE IF THE EUROTUNNEL TIMES ARE AMENDED/CHANGED BY THE CARRIER. As you may know, the new General Data Protection Regulations (GDPR) comes into force on 25th May 2018. That means we are required to refresh your consent to remain on our mailing list. Marchants Coaches Limited of 61 Clarence Street, Cheltenham, Gloucestershire, GL50 3LB acts as data controller in relation to your information. At present, we use your contact preferences to send you emails or letters when the new school bus passes are available to book, to post out our new holiday brochures when they become available and to send you any special offers that may appeal to you (E.G. Andre Rieu concert dates) based on what you may have previously booked with us. In order for us to continue to send these to you we require you to update your consent choices, which are  Post, Email, Phone and SMS. If you would prefer not to receive these from us then you can request all consent is removed and you will no longer receive any marketing emails or mail shots from us after May 25th 2018. If you have registered on our website (www.marchants-coaches.com) then you can also amend your preferences by logging into your account and clicking on the Edit Contact Consent Preferences in the Manage My Account section. You can update your contact preferences at any time should you change your mind about receiving information from us. Please note that we will still contact you either by phone, email or letter, should we need to contact you, in relation to any current/future bookings or any outstanding balances that you have with us. For example; should we need to cancel an excursion that you are booked on, we will contact you to advise this at the earliest opportunity (either via phone/email or via post as a last resort). We will keep your data until such time as you tell us that you do not want us to, or until such a time that there has been a period of 1 year inactivity using your details. At present we store the photographs sent to us, on our secure server, for one academic year in order to process the original bus pass and any subsequent replacement passes that may be requested. If you would prefer that we do not hold your childs photograph after the initial bus pass has been created, please email hometoschool@marchants-coaches.com requesting the photograph be removed from our database and this will be actioned as soon as the initial pass has been collected. Please note that should a replacement bus pass be required, a new photograph will need to be submitted before the replacement pass can be actioned. You may have already updated your consent choices in the last couple of weeks. If this is the case then you do not need to contact us unless you would like to amend your choices. We store data electronically, and take all reasonable measures to keep it safe. We do NOT use cloud storage. We do not pass any of your data to any other party, for any reason, at any time, unless we are required to do so by Law. You always have the right to be forgotten. This means that if you would no longer like us to hold your details then you can request we remove them from our database at any time. You can request this via phone on 01242 257714, by email to sales@marchants-coaches.com or in writing to: Marchants Coaches Travel Office, 61 Clarence Street, Cheltenham, GL50 3LB. Please note however that this does not apply if you have any current or future bookings with us or any outstanding balances of monies owed. This does not stop you from contacting us in any future instances where you may require a booking; but we would be required to ask for all of your details again. You can also contact us as above if you wish to access or correct the data which we hold about you, or in certain circumstances to restrict its processing. If you have a complaint about the way we are handling your data you have the right to complain to the Information Commissioners Office  www.ico.org.uk.